The Spiel Des Jahres awards are generally considered the Oscars or Emmy’s of the board game industry. Winning one of the annual awards is a sign of a quality board game and generally leads to success/popularity for the games that are chosen. While I haven’t played a ton of the games that have won Spiel Des Jahres awards, all of the games that I have played are at least very solid games. 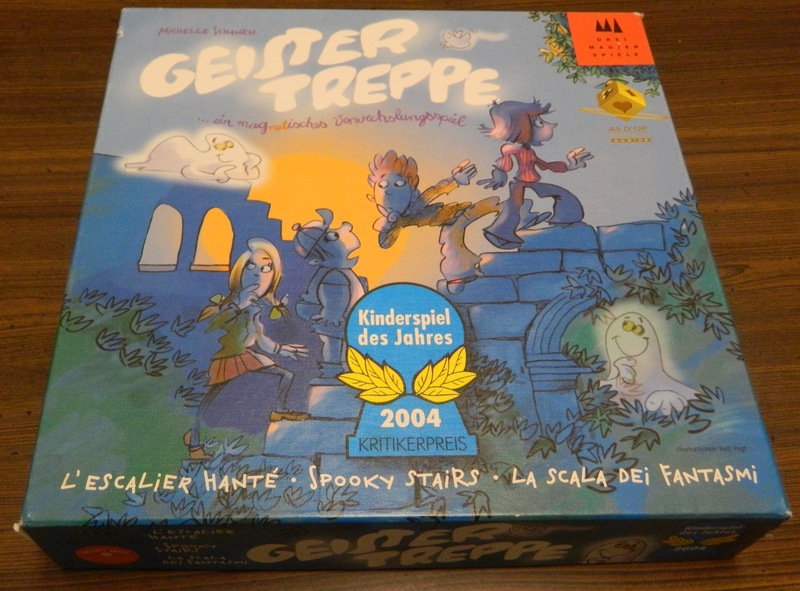 This brings us to today’s game Spooky Stairs which is also known as Geistertreppe which won the Kinderspiel Des Jahres (Children’s Game of the Year) in 2004. Being the winner of the children’s award and not having any young children to play the game with, I didn’t know what I would think of Spooky Stairs. The children’s award winners are usually given to games that are for the whole family so I didn’t know how the game would play with an adult audience. After playing the game I have to say that Spooky Stairs is better left for younger children. Place the gameboard in the center of the table. Each player chooses a color. They place the player piece of their color on the start space and put the same color disk in front of themselves to indicate their color. The youngest player will get to go first. A player begins their turn by rolling the die. If the player rolls a number, they move their piece the corresponding number of spaces forward on the gameboard. The green player has rolled a two and moves their player piece forward two spaces. If a player rolls a ghost, the player puts a ghost figure over one of the playing pieces. 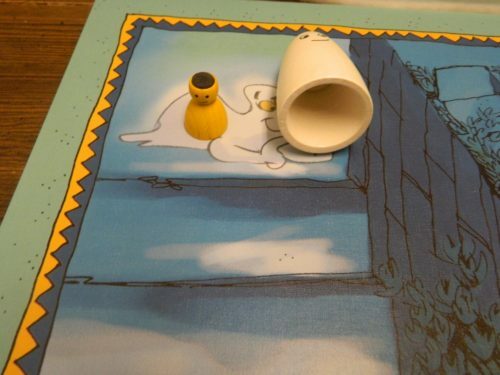 Once the ghost has been placed on top of a piece, the ghost may not be tipped over to see what piece is beneath the ghost for the rest of the game. If a player’s piece has been covered with a ghost the player will move forward the ghost that they think has their piece underneath it for the rest of the game. One of the players has rolled a ghost symbol and they chose to put the ghost on top of the green playing piece. Once all of the figures have a ghost on top of them, each ghost symbol rolled will let the player swap the positions of any two ghosts. 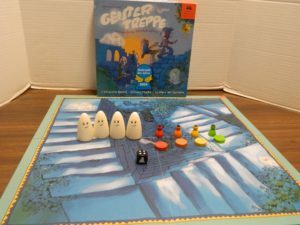 If you are playing the game with the advanced rules, a player that rolls a ghost symbol can instead choose to swap the color disks of two players which changes which playing piece belongs to each player. All of the player pieces have had a ghost placed on top of them. 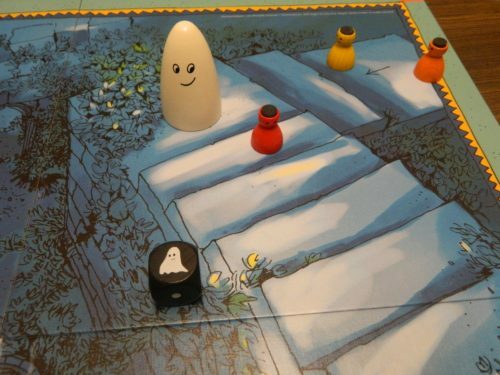 Since another ghost has been rolled, the player can either swap the position of two ghosts or change two players’ colored tokens if the advanced rules are being used. The game ends when one of the ghosts/playing pieces reach the top step (does not have to be by exact count). If the piece has a ghost over it, the ghost is removed to show which piece reached the finish first. Whoever controls the piece that reached the finish first wins the game. A ghost has reached the finish space. Underneath the ghost was the yellow playing piece so the yellow player wins the game. Before I start talking about my thoughts on Spooky Stairs I want to reiterate that I did not play Spooky Stairs with any younger children. With the game’s target audience being families with young children, Spooky Stairs was not created with an adult audience in mind. Therefore if your group fits in the target demographic, you should enjoy the game quite a bit more than my group did. 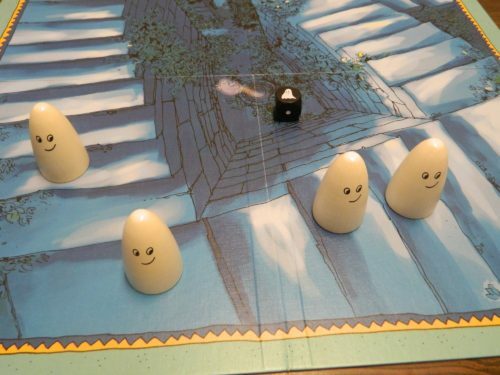 At its’ core Spooky Stairs is a roll and move game. You roll the die and move the corresponding number of spaces. If this was all that Spooky Stairs had, the game would be no different than the hundreds to thousands of other children’s roll and move games that have been released. 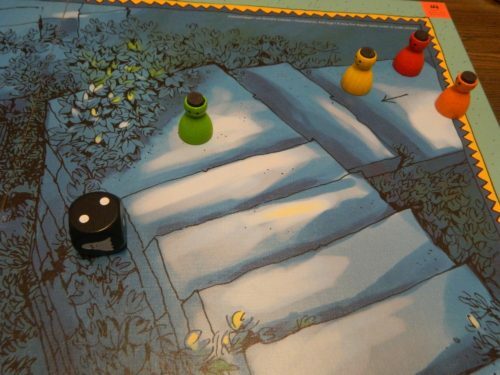 The one unique mechanic in Spooky Stairs is the idea of mixing a memory game with the roll and move mechanic. Unless a player is really lucky, every players’ piece will be covered by a ghost at some point. Since you can’t look under the ghost figure you need to remember for the rest of the game which ghost hides your character. While this doesn’t drastically change the game’s roll and move mechanics, it does a good job of tweaking the formula enough to make the game feel different than your typical roll and move game. While I didn’t really care for Spooky Stairs, I can still see why Spooky Stairs won the Kinderspiel Des Jahres. The Spiel Des Jahres voters generally like to pick games that are easy to play and yet do something original at the same time. Spooky Stairs fits both of these qualities. The game is really easy and can be learned in minutes. Spooky Stairs is accessible to the point where children of almost any age should be able to play the game. I can see younger children really enjoying the game due to the game’s cute theme, accessibility and short length. The other thing that the game really deserves credit for are the components. The game has a cute theme and the components do a good job supporting the theme. I love the game’s wood components especially the cute little ghosts. The game is quite clever with how it uses magnets to hide the playing pieces underneath the ghosts. The gameboard is sturdy and the artwork is quite good. There is really nothing to complain about as far as the components are concerned. While I can see Spooky Stairs working really well for young children and their parents, I just don’t see the game working for older children and adults. Spooky Stairs is just too easy for older players which makes the game pretty boring. Unless you are not paying attention, have terrible memory, or are so drunk/high that you can’t think straight I can’t see people having much trouble remembering where their piece is located. Since the memory mechanic is the only thing that separates Spooky Stairs from every other roll and move game, Spooky Stairs plays like every other roll and move game due to the memory aspect being so easy. With the memory mechanic not really coming into play, Spooky Stairs tends to rely almost entirely on luck. If all of the players can remember where their pieces are located, the player that rolls the best is going to win the game. When rolling the die you either want to roll a high number or a ghost symbol. If you are in first you want to roll a high number so you can reach the finish quicker. If you are not in first you are probably going to want to roll a ghost so you can switch your piece with the piece that is in first place. Outside of people forgetting which piece is theirs, the luckiest player should win Spooky Stairs every single time. If you are playing the game exclusively with adults or older children you are going to want to use the advanced rules if you want any challenge whatsoever. Basically the advanced rules force you to have to remember who controls all four ghosts since the advanced rules allow players to swap players’ colors which maymess up some players. If you are paying attention throughout the whole game though this still shouldn’t cause too many issues. If you are not in first you are going to want to trade colors with the player in first or you will want to swap two of the other players’ pieces in order to try and confuse them. While this does make the game a little more challenging, I don’t think it does a lot to fix the difficulty problems with the game. The final complaint I have with Spooky Stairs is with the length. While the short length works for younger children that can’t play longer games, it is way too short. I personally see the game usually taking five to ten minutes. The short length makes the game even easier for adults and just makes the luck even more prevalent since you have very little time to make up for a bad roll. While I wouldn’t have made the game a lot longer, I think the game could have benefited from being five or ten minutes longer. Should You Buy Spooky Stairs? If you look at the rating that I game Spooky Stairs you probably think that I think Spooky Stairs is a bad game. That is not entirely accurate. As a game for adults/older children, Spooky Stairs is not a good game. It is way too easy to remember which piece is yours which basically removes the memory aspect from the game. The game is then forced to rely entirely on luck. Spooky Stairs was not made for older children and adults though. For its’ target audience of young children and their parents I think Spooky Stairs is actually a pretty good game. The game does something unique with the generic roll and move game and the game has some really nice components. When I rated the game though I had to rate it for adults since that is who I played it with. If you have younger children the game would probably be rated considerably higher. Basically if you don’t have any young children, I don’t see you really enjoying Spooky Stairs. If you have young children though and think they will enjoy the ghost theme, I think you could get quite a bit of enjoyment out of Spooky Stairs. Younger children will probably enjoy the game quite a bit. Too easy and boring for adults. Relies too much on luck.